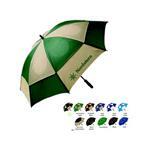 62" arc Square golf umbrella. 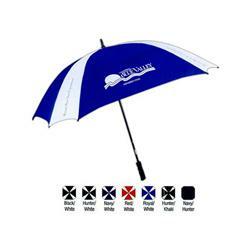 Wind vents allow umbrella to withstand gusts up to 60mph without inverting. Fiberglass shaft and ribs, Rubber pistol grip handle. Extra large imprint area, 18" left to right! Unique design, really stands out in a crowd. This is an eye catching design and functional too. Wait, too many options? Not enough? Forget the browsing and call our professional staff – we’ve touched all these items and know the quality levels! RUSH AVAILABLE! Production Times Available: 5-7 business days. Please inquire for rush orders!! Typical Imprint Area(s): 18"w x 6"h per rectangular panel.